BSAR members are issued with hi-vis safety clothing, subject to availability. Safety clothing enhances members’ safety and ensures that BSAR members identify and operate as one organisation when on search operations and training. Wear and tear on members’ personal clothing in harsh search environments is also reduced. Upon joining, each member receives a hi-vis BSAR cap and beanie. 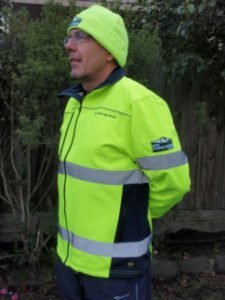 After participation in two BSAR events, a member becomes eligible to receive the hi-vis BSAR safety shirt and softshell jacket. Generally batches of the BSAR shirts and jackets are ordered annually or biennially depending on demand and funding. Hi-vis, safety vests with logos are issued to members attending each search for wearing over rain jackets. These are returned at the end of each search. BSAR Field Organisers are also issued with a hi-vis identification safety vest on appointment to the FO position. 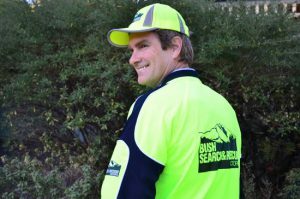 In late 2017 Bush Search and Rescue members acquired a first round of twenty high-vis heavy-duty rain shell jackets for searching. 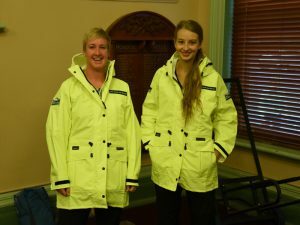 BSAR thanks the Department of Justice Victoria, Bushwalking Victoria and the JJ Gardiner Trust for funding BSAR safety clothing for members.